This guide is for managing or adding products once you have already created a shop and have gone through the Shop Setup Wizard. If you have not yet created your shop and gone through the wizard, then please refer to the Creating a Shop: Importing a Product List. If you plan to manage your product list via csv. file – we would recommend that you import your list whenever you make any changes. If you only have a few updates to make, you can always make these changes individually using the simple web interface (then export your updated product list). To find out more about how to do this, please take a look at the Managing & Adding Products Individually Guide. Step 1: The first page that you will be brought to is the Product List; press the Import button. 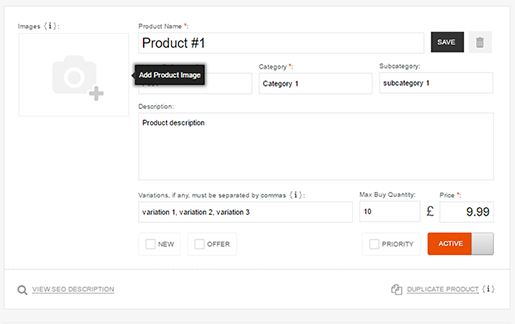 Step 2: Scroll down to the Upload (Import) Your Product List .CSV File section. If you are adding new products, please do ensure that they are in the correct structure, adding these new items to your existing list will ensure that they are in the correct order. Once you are ready press the Import File button, select your file and press Open. If there are any problems with the .csv file; the line and error type will be listed at the bottom of the page. Import new products in my .CSV file. Delete products from my Product List that are not in my .CSV file. Update existing products in my Product List. Check the box for the options required, then click Save & Finish. Step 4: This will now take you to your Product List, and you will see all of your products listed. If you have the file names of your images included in your .csv file, you will need to upload to your Media Library before they will be displayed alongside your products.